I wrote a post in late February praising Porta Pizza in Asbury Park, but I mentioned that they did much more than just dinner–including weekend brunch. Well, keeping true to my promise, I checked out their brunch on a cold, drizzly, early Spring Saturday, and I wasn’t disappointed! I met up with a friend of mine, Carolyn, for what seems to be becoming our semi-monthly (or six-monthly, as the case may be) meetup. And as much as I’ve been waiting to try brunch at Porta, funnily enough, it was her suggestion. (Great minds think alike, I suppose.) So, this past weekend, we headed to Asbury Park in the rain and the cold to meet up for what turned out to be a spectacular brunch. 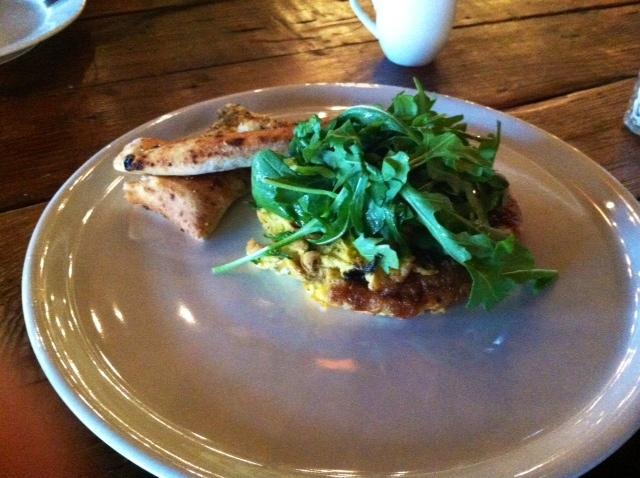 Porta’s brunch menu is unique and varied, with a mix of their usuals and brunch-only options. They offer sweet and savory, breakfast and lunch, ranging from pizza and salads to french toast and fritattas. We agreed that the best and only way to do this brunch was to try multiple things and share them. Luckily, we have similar palates so this did not prove too much of a challenge. 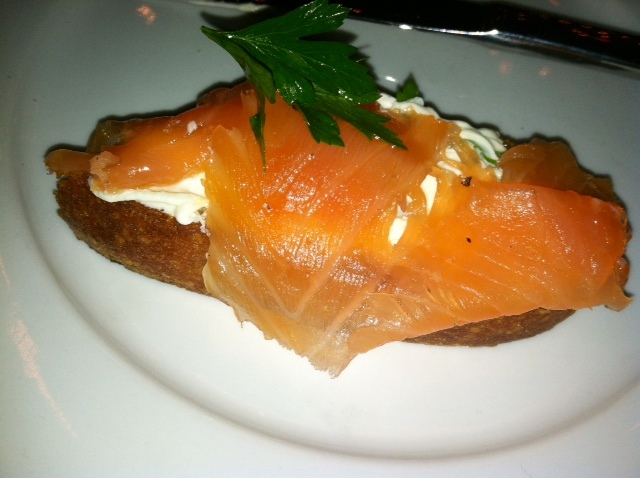 We started with a house-cured salmon appetizer with crostinis, marscapone cheese and chervil. As you can see, I couldn't wait long enough to get a picture before I dug in. This one was so good I’m afraid I’ll never be able to eat a regular bagel with lox and cream cheese again. My first thought when the plate arrived was, “I wish they gave us some lemon to squeeze over the fish.” But as soon as I tasted it, I realized it was already there. The salmon was finished with lemon, olive oil and garlic, and the spicy-citrusy taste was bright and abundant. With the smooth, luscious marscapone and crispy-chewey crosinis, I was in a Jewish-Italian heaven. I could have ordered three plates of that alone and been perfectly content. 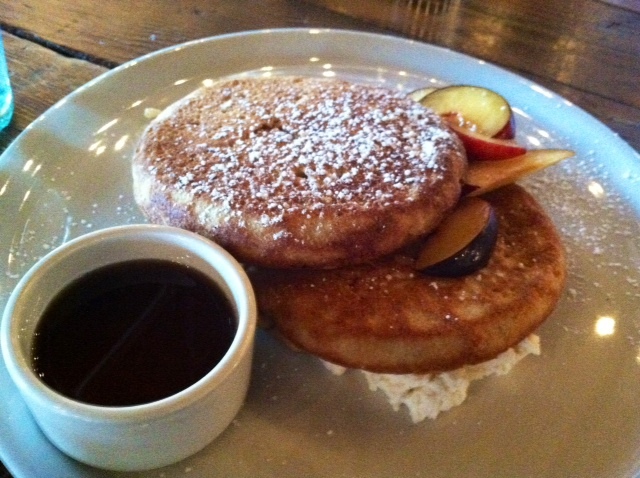 Well, almost…we also ordered lemon-ricotta pancakes which were the lightest, fluffiest pancakes I’ve ever seen. As Carolyn put it, “much more cake than pan.” They were served over ricotta cheese with a vanilla brown butter syrup and macerated plums. I didn’t expect a big punch of lemon, since in a pancake or similar baked good, the lemon flavor is typically subtle and underlying. But these pancakes packed a lemon punch! The lemon flavor was intense, but not fake, and most definitely a pleasant surprise for a lemon-lover like me. And, I need to find out how to make such fluffy pancakes. It's so fluffy I'm gonna die!!! We had decided we were also going to try their butternut squash pizza, which neither of us had ever seen on the dinner menu, and sounded like quite the savory-sweet experience. When the waitress informed us they were all out, Carolyn and I looked at each other like sad children for a moment before settling on the roasted tomato fritatta with smoked mozzarella instead. Fritatta with that wonderful-smelling focaccia that made me so hungry! So, that’s two down for Porta, and I would recommend their brunch to anyone. I actually really want to take my mom since a lot of their brunch options are seemingly gluten-free, like the fritattas and other egg-inclusive dishes (braised Beluga lentils with quail eggs, for instance.) Even the salmon appetizer–the crostinis tasted great, but they’re really just a vessel for carrying the cheese and the salmon. They’re not a necessity. Carolyn ate some of the leftover salmon and cheese once the bread ran out and she agreed, she didn’t miss them. OK, so next up, I guess I will have to check out Porta’s nightlife. Or gluten-free pizza Tuesdays. Or spaghetti and meatballs Sundays. Or… the list goes on. All I know is I want to go back to Porta over and over again. Old favorites...New discoveries. Fresh and easy! Cooking with no one but a pan and a plan. A catalogue of my literary and culinary pursuits and perusals. Not just another WordPress.com site!